War-ravaged and with few international connections, Syrian exporters are extremely dependent on neighboring markets. 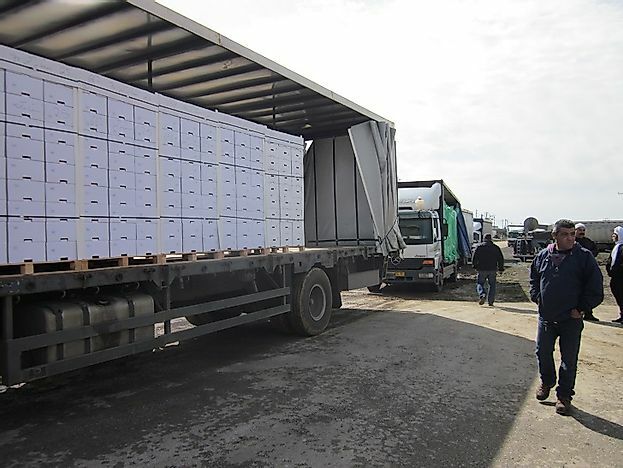 Trucks laden with export goods are transferred between Syria and Israel at the Quneitra Crossing. Countries in the Middle East and Northern part of Africa have diverse and abundant natural resources. While some countries have abundant oil or mineral deposits, other nations have land suitable for large-scale agricultural production. Political differences have, however, prevented a cohesive association in the region. Some countries, such Syria and Iraq, which have been gripped with wars and subjected to international sanctions, have turned to their neighbors to cultivate trade relations. Economies most dependent on exports to the Middle East and Northern Africa are discussed below. War-ravaged and with only a few international connections, Syrian exporters are extremely dependent on neighboring markets. 72.2% of Syrian’s exports are destined for markets in the Middle East and North Africa. Syria has been victim to international trade sanctions and has cultivated regional trade to sustain its economy. Syria trades extensively with Lebanon, Jordan, and Iraq, countries which are strategically located along its borders. Good trade relations with Iraq influenced Iraq’s decision not to participate in the vote to drive out Syria from the League of Arab States. Syria opposed the occupation of Iraq by foreign troops significantly and continued to play a small role towards the stability of Iraq. Syria also exports heavily to Lebanon, a country with which it has strong economic and political ties. The civil war in Syria has caused exports to Lebanon to decrease significantly, as production activities in Syria have been affected. Friendly relations have also facilitated the influx of Syrian refugees to Lebanon. Main exports of Syria include crude oil, cotton, petroleum products, calcium phosphates, apples and pears, spice seeds and vegetables. 33.5% of exports from Algeria are destined for countries in the Middle East and North African countries. Algeria is an oil-rich country and, surrounded by oil-rich neighbors has resorted to products such as hydrocarbons and fishery produce for regional markets. The greatest ally of Algeria is Tunisia, with which it has cultivated strong economic relations. Algeria also maintains trade ties with Turkey, Egypt, and Saudi Arabia. 30.6% of exports from North Korea head for far away markets in the Middle East and North African countries. North Korea has faced international sanctions from western countries and has looked to other export markets. Pakistan emerged as a trade ally to North Korea in the 1990s when it was confronted with an unstable economy. Pakistan still continues to be the largest export destination for North Korea’s imports to the Middle East. As some countries have been explicitly exposed to North Korea’s nuclear programs, the country has established bilateral relations with other countries such as Angola, Egypt, Libya, Iran, Palestine, and Syria. Main exports of North Korea are armaments, iron ore, garments and textiles, minerals, coal, zinc and metallurgical products. 26.2% of exports from Jordan head to countries in the Middle East and Northern Africa. Primary importers of Jordan’s exports in the Middle East are Saudi Arabia, Iraq, the United Arab Emirates, and Israel. The country also has free trade agreements with Algeria, Syria, Libya and Tunisia. Jordan is a signatory to the Greater Arab Free Trade Agreement and the Agadir Agreement which promotes regional trade with its neighbors. Jordan has enjoyed political stability which has facilitated a surge in its economic growth. The country has emerged as a leading exporter to countries in the Middle East and North Africa. Major exports from Jordan are phosphates, potash, clothing, pharmaceutical products, chemical fertilizers, and vegetables. Other economies dependent on exports to the Middle East and North Africa are Lebanon (24.2%), Somalia (19.6%), Egypt (18.7%), Turkey (18.3%), the United Arab Emirates (14.4%), and Armenia (12.5%). Countries in the Middle East and North Africa are emerging as lucrative markets for world’s exports. Their attractiveness is mainly due to tremendous economic growth in the recent years. Exports to these countries, in regard to future trends, are set to increase.